EZ-Bathe Inflatable Bath Tub from HealthyKin.com allows clients to enjoy a bath or shower without leaving their bed. The client simply rolls onto the vinyl tub, which is then inflated around them using the included wet-dry vacuum. The reinforced tub with its new streamlined design is longer and deeper. The tub inflates to 71"L x 31"W x 13½"H to accommodate individuals up to 6' 2". A drain is located at the foot of the tub. 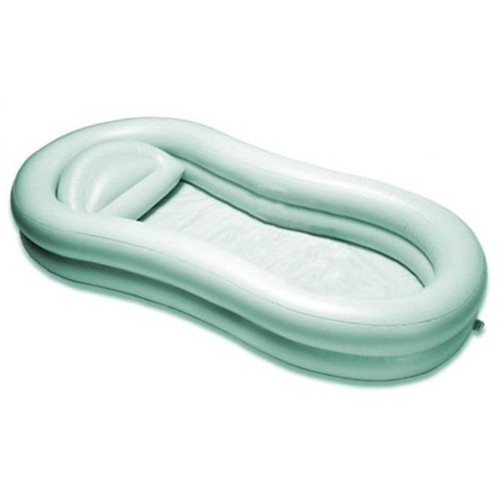 The EZ-Bathe Inflatable Bath Tub fits nearly all beds. The included hand-held shower connects to a tap up to 25-feet away. The included drain hose (leading to bathtub, sink or toilet) can be turned off for a long soak or left on for constant draining, allowing a shower. The drain hose and vacuum, both included, empty the tub thoroughly. Fits users up to 6' 2"
I am an occupational therapist and have used this item in homes where it is impossible to access the bathroom. It takes a bit of practice as if the patient is able to sit and is heavy, the water goes to THAT END OF THE TUB and the drain plug is at the other, requiring a lot of dry vac removal and emptying. Once the initial kinks are worked out, it's great. I had a client that had not been able to shower in eight years and she just LOVED it. I need to return this as it's just to big for our needs. I still would recommend it for caregivers of a loved one who can stay in their beds rather than a hospital bed.